We all got our favorite cuts of meat. If you ask me I’ll always go for the cheeks! Thinking about pork and beef cheeks. They are perfect for slow cooking projects. I had never thought about searching for venison cheeks before. Until Carmans delivered me these beauties. 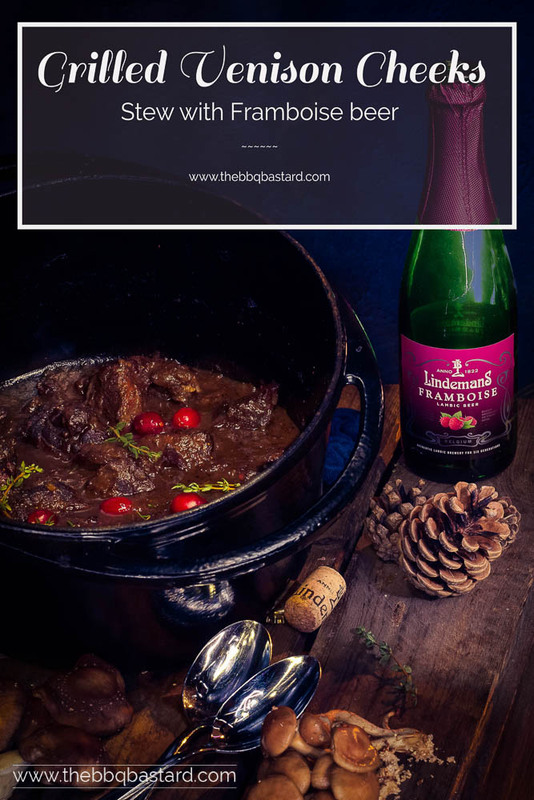 Time for a grilled venison cheeks stew with raspberry beer, based on the classic flemish stew. This pimped stew is excellent for a cold sunday project and might even fit well on your holiday menu. Check it out now and start drooling. Autumn! The best season of the year bringing a load of delicious wild game cuts on the market. 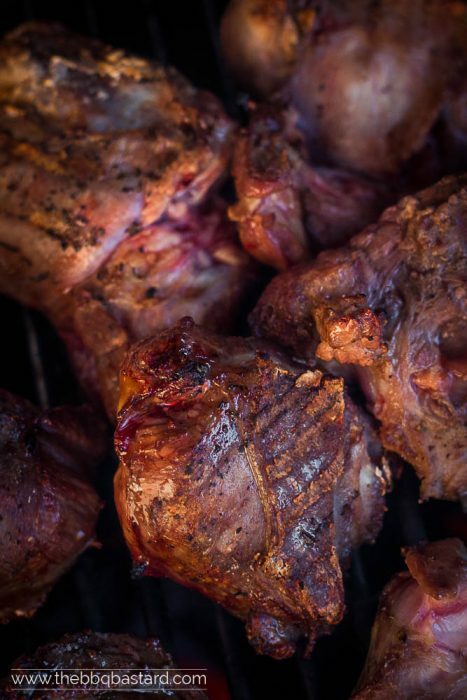 Venison, meat of a deer, is just one of those flavor bombs. Animals living out in the wild are fed with natural products like grass, herbs, nuts, … Besides the natural food they have a lot of space to run freely and live a peaceful life. This all leading to lean cuts of meat with a stunning concentrated flavor. Venison cheeks have a pork like texture but taste slighly beefy if you need to compare it to something well-known. But to be honest you got to taste them to know how good they are. I had the luck to get these beauties from my butcher “Carmans” who presented them as a test product. Like mentioned before most wild game meat is rather lean. Since the cheeks are mussels that have been used a lot the meat is rather though to grill. In order to convert the though interstitial tissue into tender and juicy gelatin, the meat needs to be slowly cooked for several hours. This can be done on indirect heat for several hours like I did with these pork cheeks. BUT you can also remove the dust from your dutch oven (as far as it get’s the chance to gather some dust). Braising in a stew is a perfect technique for softening up the cheeks! And the best part: you get a stunning beer based sauce with it! That’s exactly what makes the flemish stew that spectacular. So why did I use grilled venison cheeks? Simply because they need to be coloured and the subtle touch of fire adds an extra layer of taste in the end. So what’s a Flemish stew I’ve been talking about? And why is it the roots of this recipe? Let me explain. A flemish stew (stoofvlees) is a classic “belgian” meal scoring pretty high on the comfort food scale. Especially served with belgian fries (they’re not french!!). And you know it or you don’t, but in Belgium we love beer! And that’s exactly what makes the flemish stew legendary. 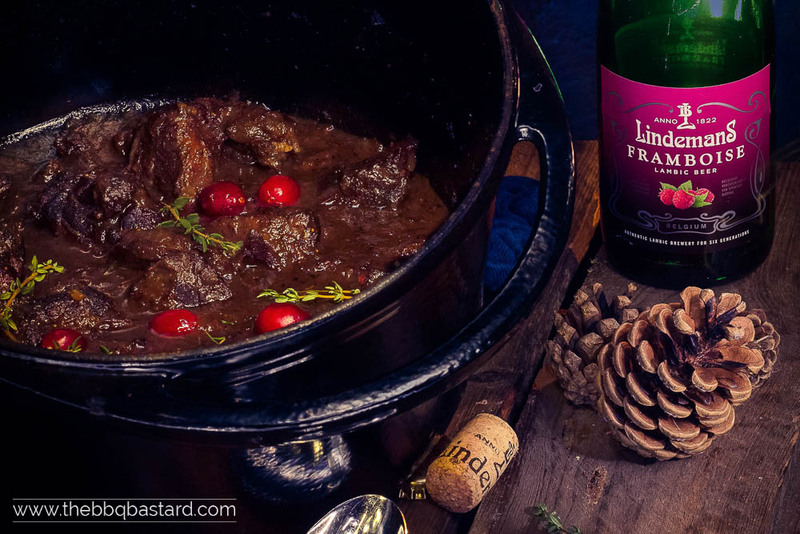 What can you expect from a classic “Stoofvlees”? Deliciously tender chuck shoulder beef braised for hours in a dark brown beer (preferably a trappist style beer). I prefer using the “St. Bernardus 12” for my stew. Besides the beer there’s also mustard, vinegar and the typical spices that flavor the stew. And something sweet to bring balance with the bitters from the beer. I like to use speculoos or “Pain d’épices” (french gingerbread) for this. It’s actually easy to make, but with the flavors wrong pretty easy to screw up! It’s all about finding the right balance at taste! Since I used grilled venison cheeks for this stew I decided to give a twist to the classic recipe without denying it’s roots. This by replacing the dark brown beer by a lambic style fruit beer. The Lindeman’s Framboise beer (raspberry beer). This beer has a sweet raspberry taste with a subtle acidity that combines well with the other ingredients in this stew. To emphasise the fruity taste tangy taste of the raspberries I decided to throw in some additonal cranberries. Besides using the beer in your grilled venison stew, you should also buy an extra bottle for drinking. I’m not much into fruit beers but this one is pretty good! Moreover it get’s a great score at ratebeer too! I was very curious to taste the grilled venison cheeks! The result was absolutely fantastic! They were tender, juicy and packed full of flavor. The Raspberry beer “Flemish stew” inspired sauce actually approached the original taste more than is thought it would. Only with a subtle fruity and slightly more tangy result. Therefore I didn’t need to add extra vinegar. I served the comforting grilled venison cheeks stew to my family on a rainy sunday afternoon with mashed parsnip puree and grilled mushrooms. A delicious. If the kids ask for more you know it’s a score! Would you serve it for the holidays? Or keep it for yourself on a cozy sunday? Start by preparing your BBQ for a direct grilling session at 200°C/400°F. 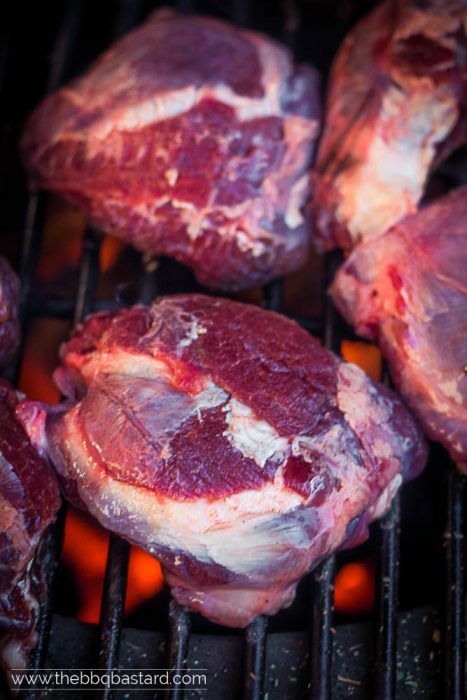 While the BBQ is heating up you season the Venison cheeks with salt and pepper. Grill the Venison cheeks until they have a nice browned and slightly crusty surface. They don't need to be fully cooked in this stage. Halve the venison cheeks and add them to the pot once the onions are slightly browned. Toss in the cranberries, raisins and Framboise beer. Let softly boil for a half hour without the lid. After a half hour the alcohol should have evaporated. 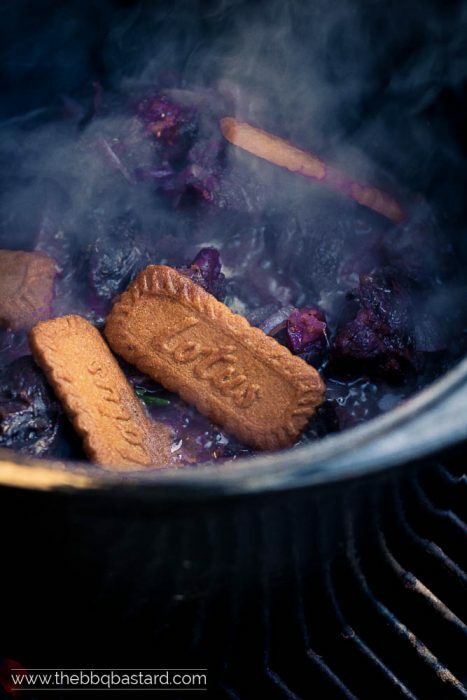 Add 8 Lotus Speculaas cookies to the stew and a tbsp. mustard. Let simmer for 2-3 hrs. until the venison cheeks are tender and almost falling apart. Close the lid. Taste and add salt and pepper and honey at taste. The Lindemans Framboise beer is slightly tangy so normally you shouldn't add some extra vinegar. When using a different brand of framboise beer it might be necessary to add some vinegar at taste. Fantastic! An unusual recipe for me, but I must try to do it. Hm…the raisins can be replaced with fresh grapes? I do not like raisins (( Good photos!